The nameplate that helped define performance SUVs is simply better than ever. 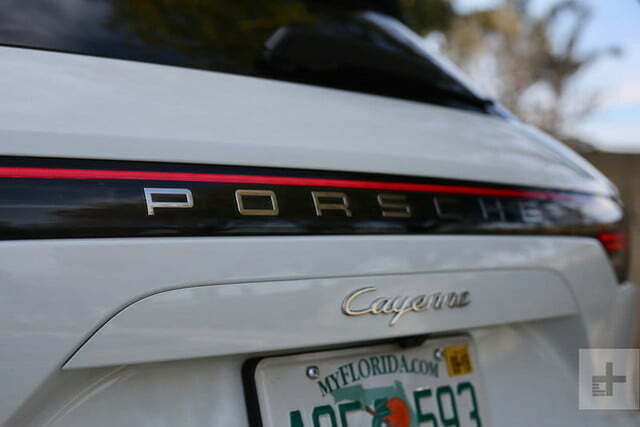 Much like it did with the 911, Porsche took an evolutionary design approach with its new Cayenne. 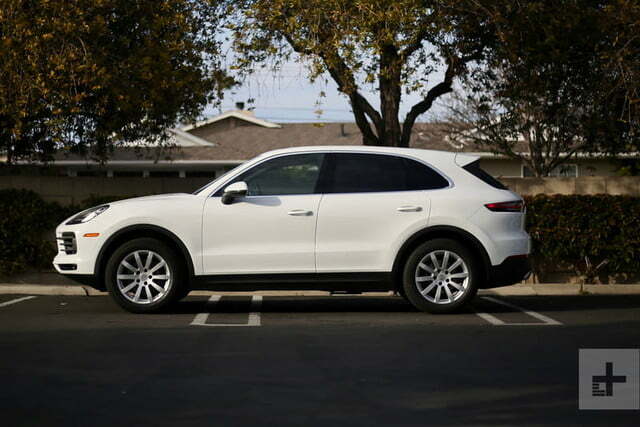 While three inches longer and 1.7 inches wider than the outgoing model, the 2019 Cayenne looks more like a gentle refresh than a top-down rebuild. 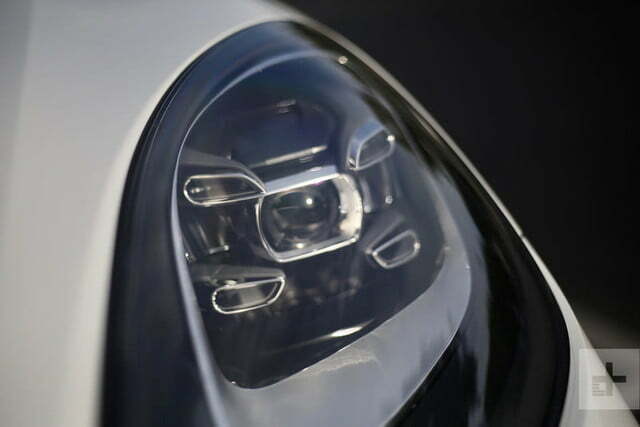 Visual tweaks include a lower, veined hood, sharper LED headlight signatures, chromed slats across the entire front fascia, new 19-, 20-, and 21-inch wheel designs, and a continuous LED taillight running the entire width of the tailgate. Notably, a short rear overhang and a steeped front overhang mean the Cayenne won’t scrape easily off-road (especially when equipped with the optional air suspension). 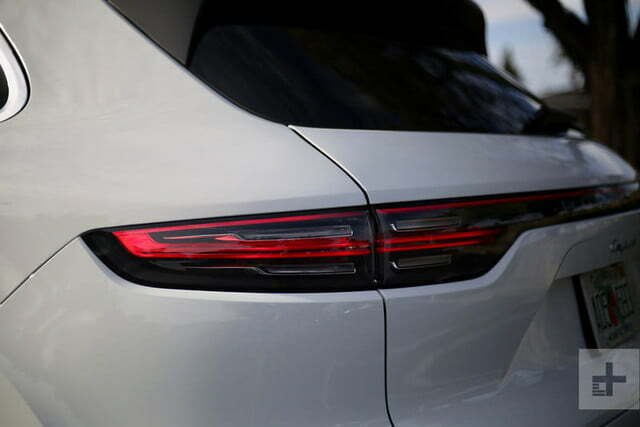 The modest redesign sufficiently modernizes the Cayenne while retaining its upscale physique. For those wanting to make a bigger stylistic impact with a Porsche mid-size SUV, the Cayenne Coupe will arrive later this year to battle the BMW X6 and Mercedes-Benz GLE Coupe. Inside, Porsche’s changes are more transparent. To reduce clutter along the center stack, Porsche replaced numerous physical controls with haptic feedback sensors along a glass surface. The sheer number of individual settings is still daunting, but the two-dimensional arrangement creates a slicker look. 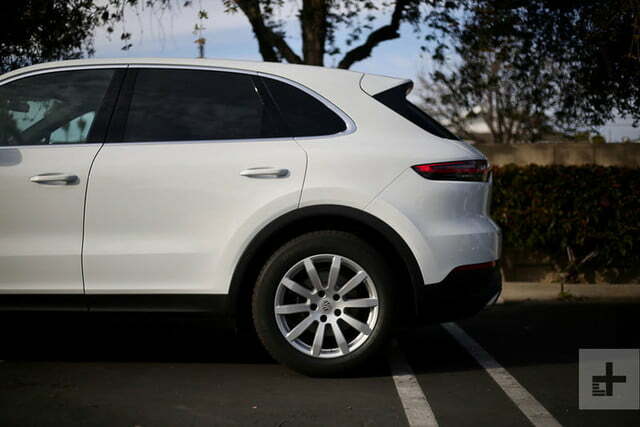 The modest redesign sufficiently modernizes the Cayenne while retaining its upscale physique. Material quality is exceptional, with a blend of brushed metals, gloss black panels or wood grain trim, soft leather, and delicate accents. While not as overtly luxurious as BMW’s new X5, the Cayenne cabin is pure business class. Eight-way power seats are standard, but we recommend the upgraded 14-way heated chairs that add lumber support. 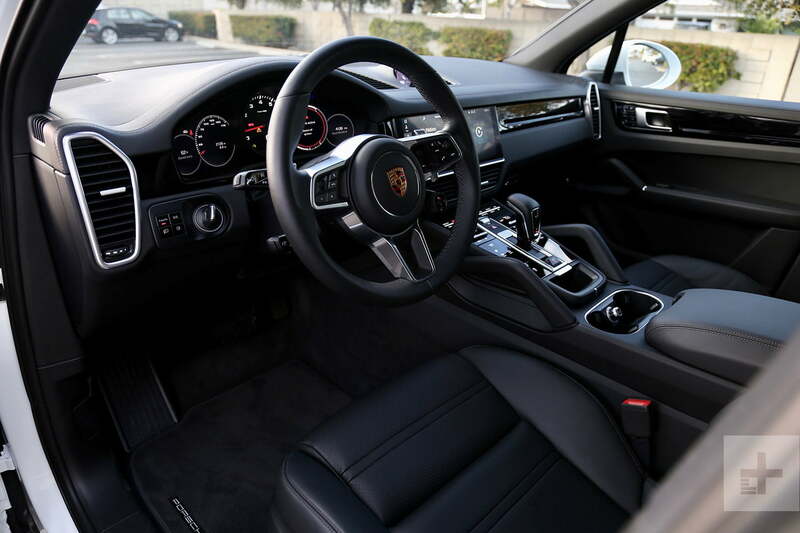 We’ve waxed poetic about Porsche’s steering wheel in other models, and the same praise must be heaped upon the new Cayenne; the design, the soft leather border, and the intuitive controls are above anything in this segment. 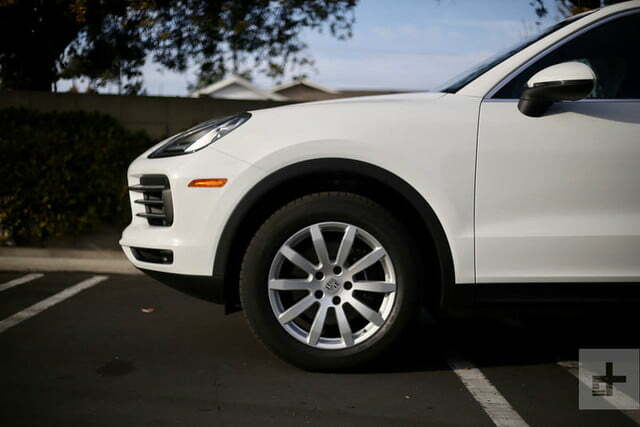 Convenience and safety technology improve substantially with the third generation Cayenne. 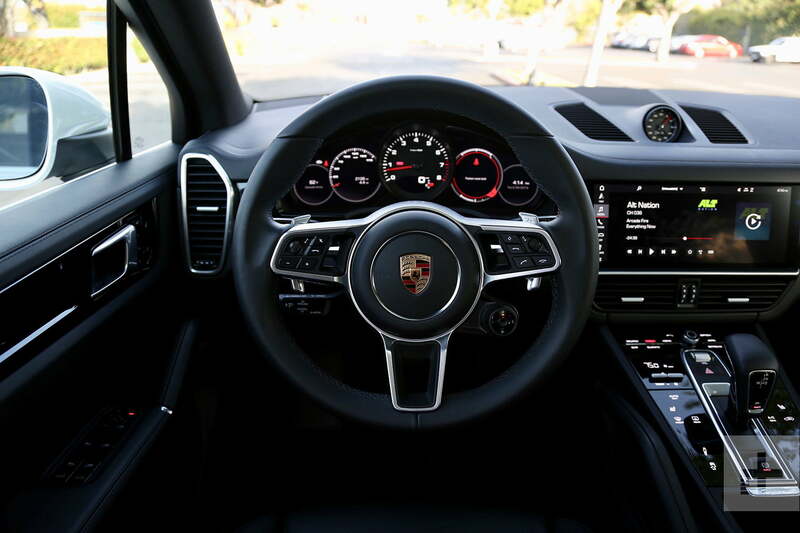 Though Porsche’s traditional analog tachometer remains front and center to the driver, it is now framed by two 7.0-inch, driver-configurable monitors that can show navigation, media, telemetry, and other information on-demand. Called Porsche Communication Management (PCM), the company’s latest infotainment system occupies a 12.3-inch touchscreen with some proximity-based controls. The screen graphics and the software’s responsiveness are on par with what we’ve experienced in recent BMW and Mercedes-Benz models, and the Cayenne comes standard with navigation and Apple CarPlay (but no Android Auto – at least not yet). Porsche’s Connect Plus system also includes apps like Amazon Music and Nest. PCM’s menu structure isn’t the most intuitive, thus requiring an initial time investment, but once you get the system down, there’s little to complain about. While not as overtly luxurious as BMW’s new X5, the Cayenne cabin is pure business class. Standard tech and active safety highlights include four USB ports, Bluetooth connectivity, an LTE Wi-Fi hotspot, and low-speed collision warning with braking assist. Optional features include night vision, front and rear park assist, lane-keeping assist, lane change assist, traffic sign recognition, a surround-view camera, a head-up display, and adaptive cruise control. Porsche also offers a traffic jam assist technology (InnoDrive) that drives the Cayenne semi-autonomously at speeds below 37 mph. 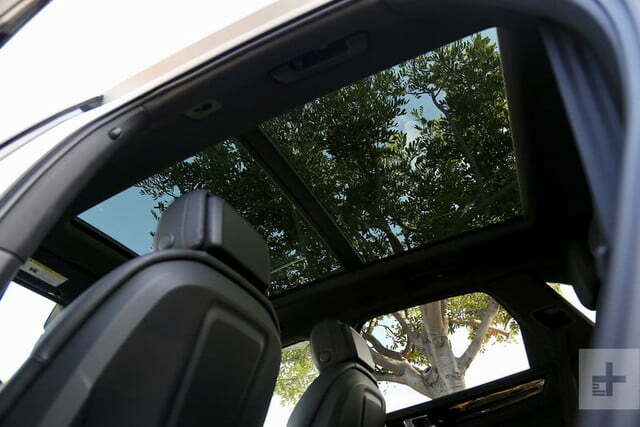 BMW and Mercedes-Benz offer similar systems on their SUV contenders. The reason enthusiasts eventually came around to the idea of a Porsche SUV was not the way it looked, it was how it drove. 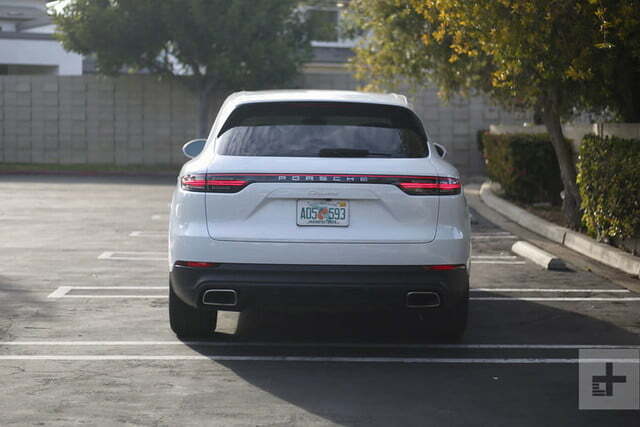 The Cayenne has always behaved more like a sport sedan than a pitching, rolling SUV, and while the physics of a high center of gravity are difficult to overcome, Porsche makes it seem easy. 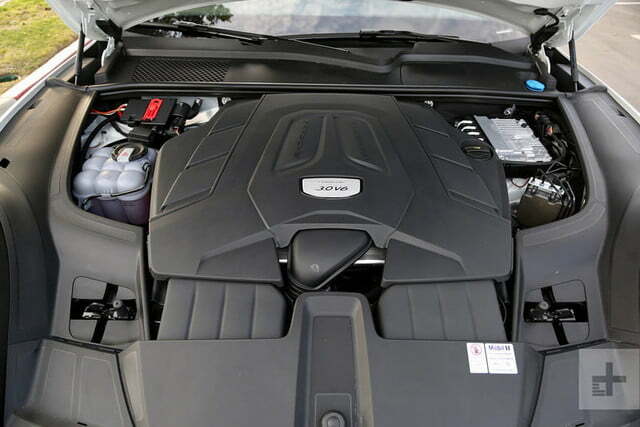 The entry-level Cayenne tested here is equipped with a 3.0-liter turbocharged V6 which replaces the outgoing model’s naturally-aspirated six. Power increases to 335 horsepower and 332 pound-feet of torque, and it’s distributed to all four wheels as standard via an eight-speed automatic transmission. Porsche claims a zero to 60 mph sprint of 5.6 seconds with optional launch control, and 5.9 seconds without. 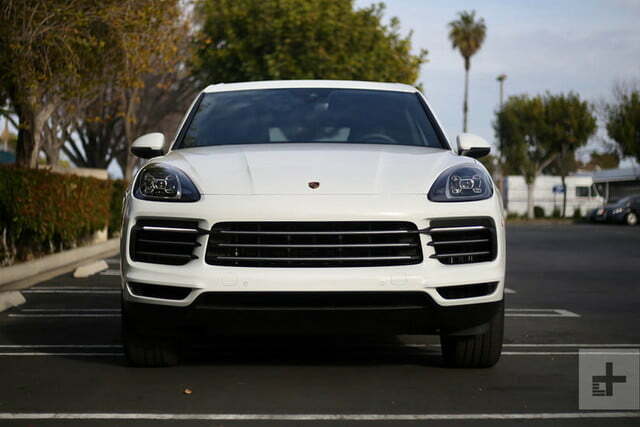 Though the Cayenne isn’t the most potent car in its class, it is the lightest, at about 4,500 pounds. Less mass to manage, combined with Porsche’s available rear-wheel steering system, active stabilizers, and adaptive dampers, combine to make the Cayenne feel downright athletic. Taking corners at double the speed limit is no challenge for the Porsche mid-sizer – even on standard, all-terrain tires. Upgrade to the optional Pirelli P Zero rubber and you’ll really be scootin’ through curves. With just the right amount of heft, the electronically assisted rack puts car and driver in lock step. 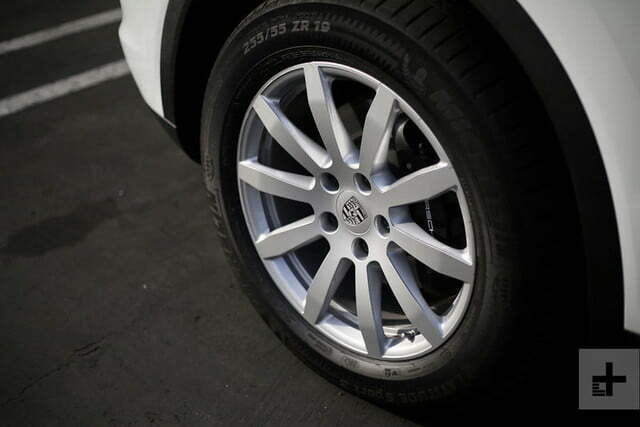 In addition to looking good, the Cayenne’s steering wheel orchestrates sharp response from the front tires. With just the right amount of heft, the electronically assisted rack puts car and driver in lock step. Only the Maserati Levante’s hydraulic steering system can match the Cayenne for engagement and feedback. Though the standard brakes are plenty capable, Porsche’s optional surface-coated brakes improve responsiveness and reduce brake dust. If that’s not enough stopping power, Porsche will also sell you a set of carbon ceramics for a cool $9,000. The Cayenne is equally suited to city and highway commutes, with supple ride quality and excellent cabin insulation. Rotating the drive mode dial to normal mode eases throttle response and smoothly works through the gears. If ever a burst of performance is needed, a quick press of the dial’s center induces sport mode responsiveness for 20 seconds before returning to normal. Fuel economy ranks towards to top of the segment, at 21 mpg in a combined cycle. Only the BMW X5 posts better figures. 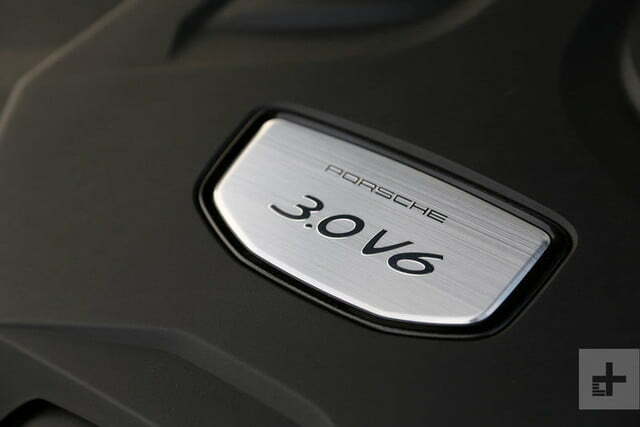 If it’s fuel economy you’re after, however, note Porsche makes a gasoline-electric hybrid variant of the Cayenne. The mid-size luxury SUV segment Porsche helped build is now overrun with compelling alternatives. Of the myriad options, BMW’s X5, Mercedes-Benz’s GLE, and Maserati’s Levante will tempt most shoppers. Redesigned for the 2019 model year, BMW’s X5 xDrive40i ($61,695) is powered by a turbocharged, inline six-cylinder engine producing 335 hp and 330 lb-ft. of torque. With standard all-wheel drive, the X5 hustles to 60 mph in 5.3 seconds and returns a segment-best 22 mpg in a combined cycle. 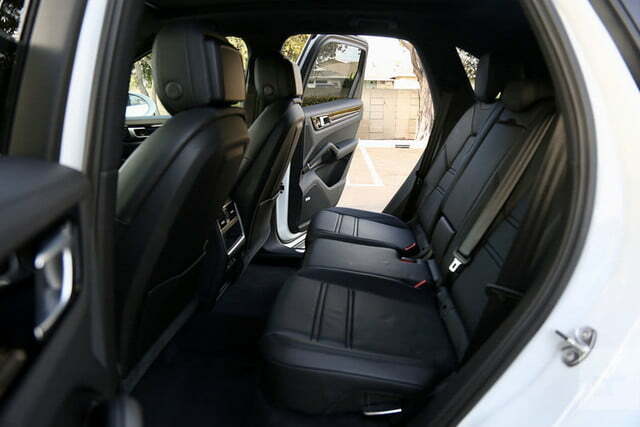 Cargo capacity stands at 33.9 cubic feet behind the second row, and 72.3 cubic feet with the rear seats folded. Also new is the 2020 Mercedes-Benz GLE ($56,695). Using a 3.0-liter, turbocharged V6 rated at 329 hp and 354 lb-ft. of torque, the all-wheel drive GLE400 4Matic hits 60 mph in 5.3 seconds, and averages 19 combined mpg. The latest GLE boasts a class-best 38.2 cubic feet of cargo space behind the second row, and 80.3 cubic feet with seats folded. Contending with Porsche for best driving dynamics is Maserati’s Levante ($76,975). Featuring a Ferrari-derived, 3.0-liter V6 turbocharged to 345 hp and 369 lb-ft. of torque, the base Levante sprints to 60 mph in 5.7 seconds but can only manage 17 combined mpg. 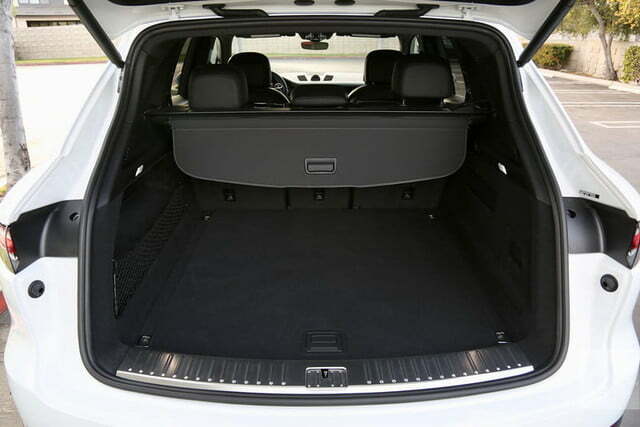 Cargo capacity behind the second row is a comparatively small 19.4 cubic feet. Porsche offers a new vehicle warranty with four years or 50,000 miles of coverage. 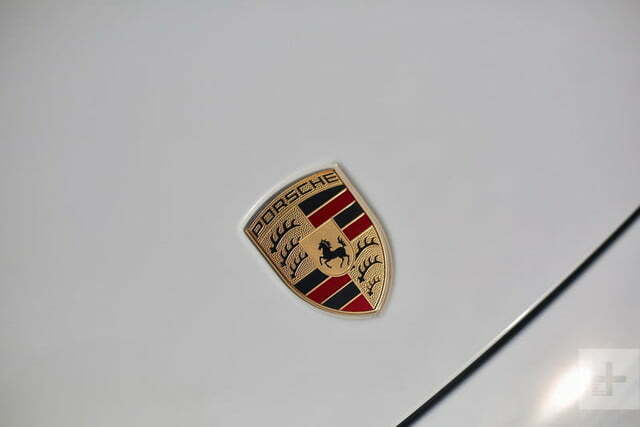 Included in the warranty is a 24-hour roadside assistance program, but unlike many of Porsche’s luxury manufacturer rivals, free scheduled maintenance is only included for the first year. 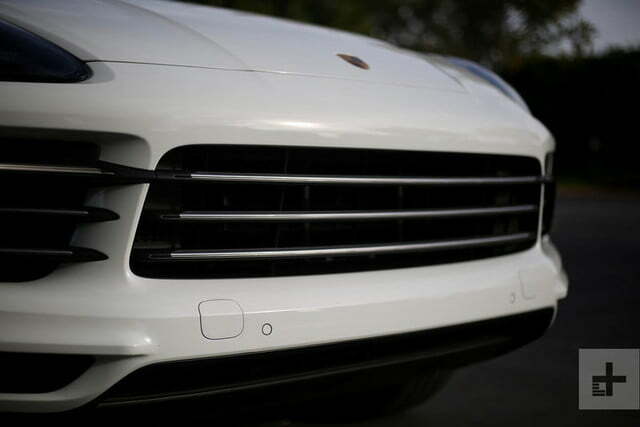 Our perfect Porsche Cayenne would be a high-tech haven. 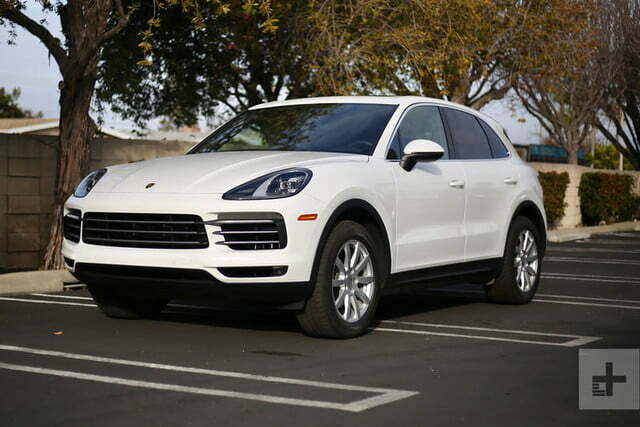 Start with Carrera white exterior paint ($800) and 20-inch Cayenne design wheels ($1,720). Inside, we’d choose the black/Mojave beige duo-tone upholstery with the premium package ($6,610) that includes 14-way power heated front seats, LED headlights, a panoramic roof, auto-dimming mirrors, adaptive steering, Bose sound system, comfort access, lane change assist, and ambient lighting. 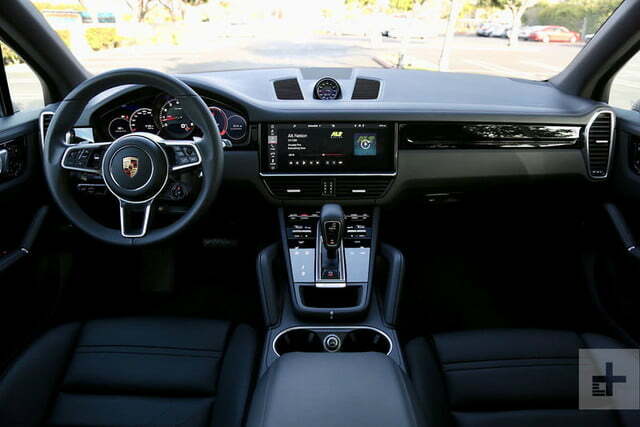 We’d also select park assist ($1,200), Porsche Innodrive ($3,610) with lane-keeping assist, traffic jam assist, and adaptive cruise control, and a head-up display ($1,720). Our final tally would be $83,000 including destination. With its armor tested, the 2019 Cayenne allows Porsche to soldier on without weakness. The nameplate that helped define performance SUVs is simply better than ever, with the technology, driving dynamics, and premium amenities that will keep demand strong and the automaker healthy. The Cayenne’s closest performance rival, the Levante, can’t match Porsche’s build quality and refinement, while luxury foes like the X5 and GLE can’t deliver the same driving pleasure. Yes. 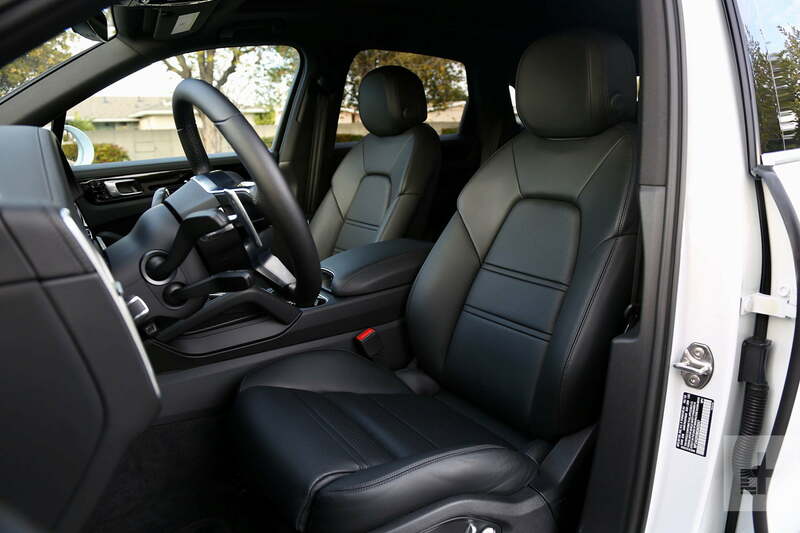 This is the premium mid-size SUV to get.